This recipe is a reader request and I thought it was such a great idea that I promptly moved it way up on my to-make list! It starts with fresh (or frozen) raspberries, which are beginning to flood grocery stores much to my delight. They’re delicious right now and will continue reaching their peak flavor as they come more into season. In other words, this isn’t my last raspberry recipe of the summer. To keep thing simple I kept this recipe to 8 ingredients! It’s also vegan, gluten-free, and naturally sweetened, so everyone can enjoy. 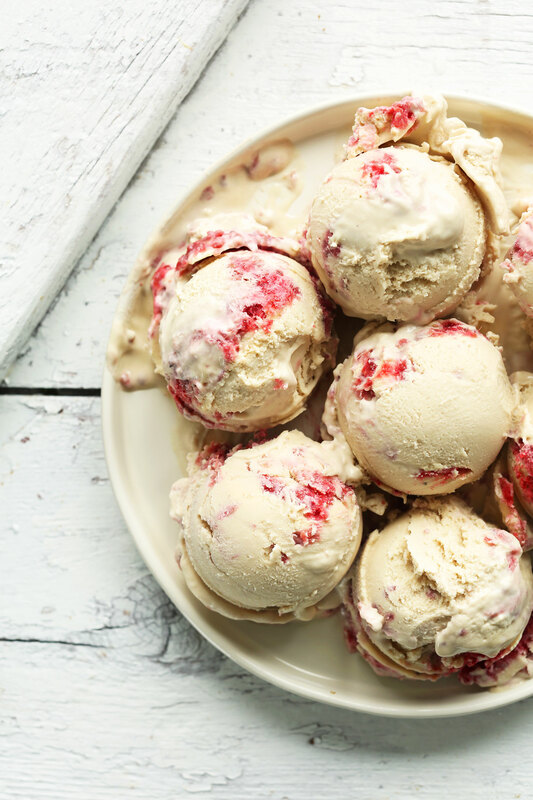 Coconut-cashew ice cream base + mashed, lightly sweetened berries added in for that “ripple,” swirl effect. 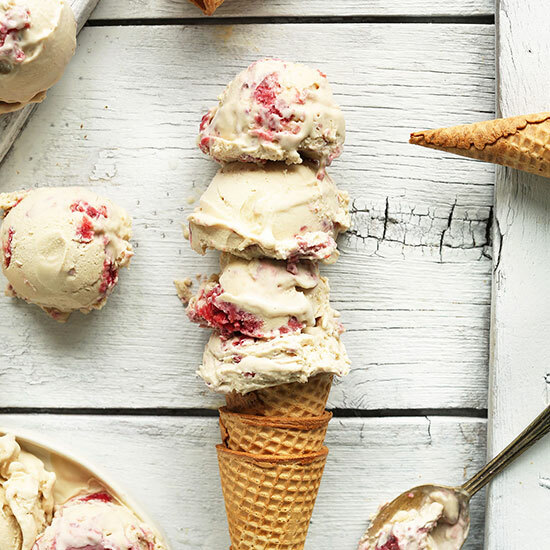 The result is a seriously creamy, tart-sweet ice cream that’s beckoning to be made this summer. The beautiful thing about making ice cream in an ice cream maker is you can eat it right away in that perfect, soft-serve state. But leave it a few more hours in the freezer and it scoops up beautifully, as you can see. If you make this recipe, let us know! There are currently so many ways to connect with us. 2. Tweet us a photo or comment. 3. Share a photo with the hashtag #minimalistbaker on Instagram. You get the idea. If you love it, let us know. Cheers, friends! 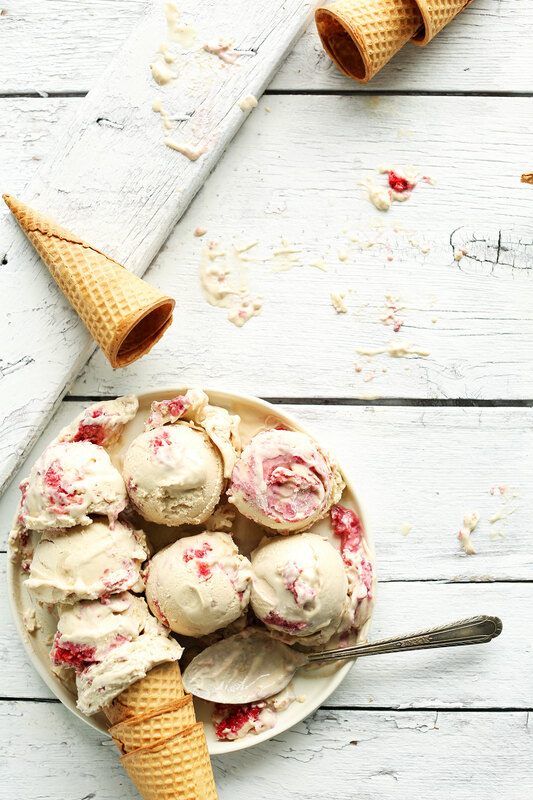 Amazing Raspberry Ripple Coconut Ice Cream that's creamy, sweet, tart, and SO delicious! Just 8 ingredients and minimal effort to create this summery, swoon-worthy treat! The night before, be sure to soak your cashews and place your ice cream maker bowl in the freezer to chill. To a high speed blender add soaked, drained cashews, coconut milk, oil, maple syrup, vanilla, sea salt and arrowroot starch. Blend until creamy and smooth, scraping down sides as needed. Taste and adjust sweetness as needed, adding more cane sugar or maple syrup if desired - I found 1/4 cup maple syrup and 1/4 cup cane sugar to be perfect (amounts as original recipe is written // adjust if altering batch size). Transfer to a mixing bowl and cover. For best results, chill overnight or for at least 5-6 hours. If in a rush, 1 1/2 to 2 hours in the freezer is sufficient. 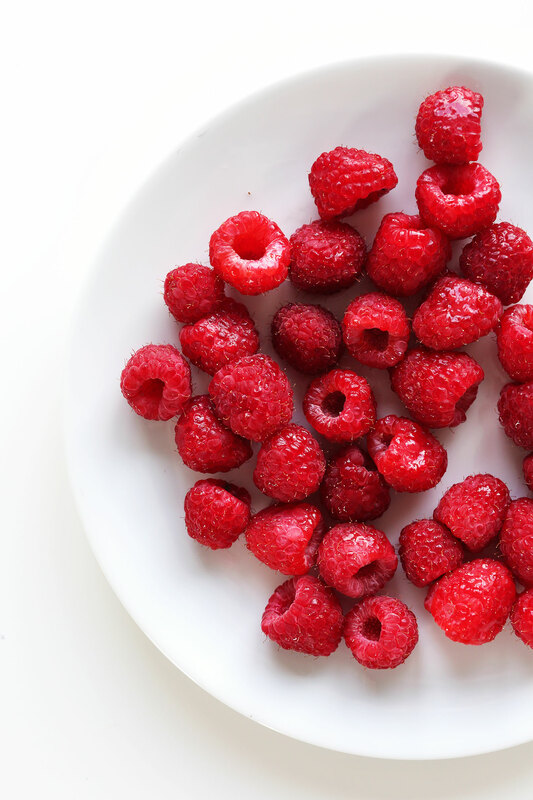 Once your base is chilled, prepare raspberries by adding to a bowl and mashing with sweetener. Set aside. Assemble your chilled ice cream maker and pour in the chilled ice cream batter. Churn until creamy and thick and resembles soft serve - about 40-45 minutes. In the last 30 seconds of churning, add in 1/2 of the raspberries and let churn until slightly swirled. Turn off machine. 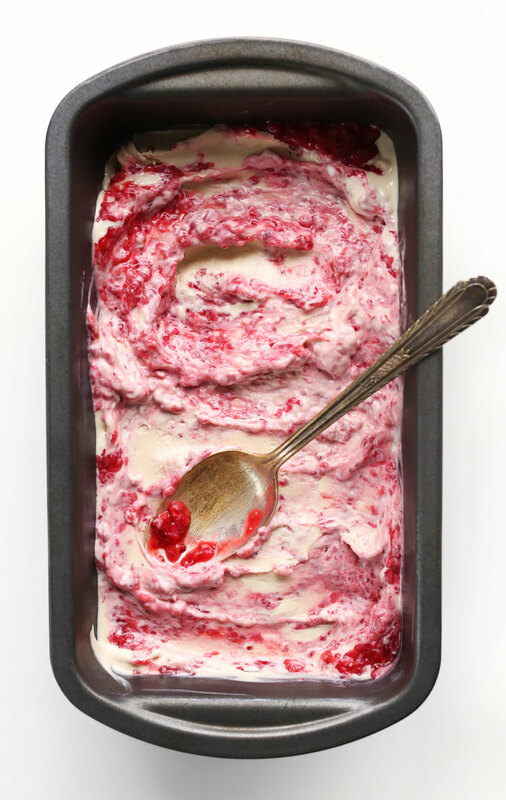 Transfer ice cream to a freezer-safe container and smooth flat with a spoon, swirling in the remaining amount of raspberries. Tap on the counter to help settle and remove any air bubbles. Cover securely and freeze for 4-5 hours or until firm. Before scooping, set out for 10-15 minutes to soften. Keeps in the freezer for up to 1 week, though best within the first few days. I made this and have made some of your ice cream recipies in the past and I keep having the same problem. When I use cashews I usually soak overnight and when the ice cream is done it’s very gritty and not smooth. What could be going wrong? Amazing recipe! Thank you for creating this. It’s the first dairy free ice cream that’s turned out well for me in an ice cream maker! Plus it only needed 20min to freeze and not 40 like the instructions say ? What can I use instead of sugar and syrup? Hi! You can try agave nectar! Recipe is awesome! I did not show the mix in the freezer I just let it cool room temperature and the ice cream came out just fine. I also didn’t recipe is awesome! I did not show the mix in the freezer I just let it cool room temperature and the ice cream came out just fine. I also didn’t churn as long-30 min- it came out soft and so good! Thanks for the recipe and detailed instructions ! Hi! I tried making your chocolate ice cream once- when I chilled the mixture overnight in the fridge it turned into pudding and was difficult to make for the ice cream maker. What about just cooling to room temperature? What do you think! Love your blog and insta pics! I think that could work, Caroline! Let us know how it goes! This looks amazing. Would love to make it, but have an allergy to cashews- any suggestions on a substitute for that ingredient? Or is it just not possible? Hi Katie! You could ditch the cashews and double up on coconut milk! I’d love to make this, but don’t have an ice cream maker! Any suggestions? Hi Michelle! You could just put the batter in a mixing bowl and freeze it for 6-8 hours, removing every hour or so to whisk/stir to incorporate air. This won’t yield as creamy of ice cream, but it will work! I bought an ice cream maker last year but have yet to successfully execute plant based ice cream. You suggest chilling the mixture before adding it to the ice cream maker, but because of the high fat content in the coconut milk the mixture is already hard, what is the consistency of yours when you pour it in?? Can I skip chilling the mixture? I am hoping to get the hang of vegan ice cream before the summer rolls in! I made this ice-cream for Easter, as we had some guests who could not have dairy or gluten. It was fantastic; very creamy, especially, if you let it get a bit softer. For those who didn’t have any allergies, I served it with Chatelaine’s raspberry orange crepe cake. What a blowout combination! I used agave syrup, but I think this recipe would be great for vegan maple walnut ice-cream, too, if you used the maple syrup. I would just stir walnut chunks in at the end, so it wouldn’t be too bitter, rather than substituting for the cashews, or you could use pecans which are a bit sweeter. Adding some home make bacon bits, along with the maple syrup, would be great for those with dairy allergies. Maple bacon ice-cream. Sounds yummy! To say that your ice cream recipe is outstanding and unbelievable is to say absolutely nothing at all. This recipe DOES NOT EXIST. There is absolutely NO WAY there could be a vegan natural-ingredient ice cream recipe that came out so creamy, rich, tasty, and simple. I can’t believe that experience was real. I know I must have been dreaming when I made and tasted this ice cream. GREAT job!!! (even if it was just in a dream). Is using an ice cream maker absolutely necessary? If not, what are the alternatives? You could just put the batter in a mixing bowl and freeze it for 6-8 hours, removing every hour or so to whisk/stir to incorporate air. This won’t yield as creamy of ice cream, but it will work! Hi Dana just wondering if this awesome looking ice cream can be made without an ice cream maker as I am only thirteen and well, jobless. I love your salted caramel ice cream too – mega yummy! What could I sub for the cashew soak bit? More canned coconut milk/cream of coconut? Hi Dana. I finally made this last night. So yummy. Thanks for ANOTHER great recipe!! I don’t think that will work but if you try let me know how it goes! My goodness this stuff is so creamy and thicker than traditional dairy ice cream! I whipped this up today and was pleasantly surprised. It tasted really rich, and although the cashews did give it a slightly off taste (I’m not a huge fan of cashews) I just added extra raspberry sauce which covered up most of the cashew taste and was able to enjoy this rich dessert. I think I will try this with just coconut cream next time and omit the cashews, similar to your no churn chocolate ice cream recipe (that was heavenly by the way!!). Thank you for the great recipes! I did tweet a bit. I added chucks of dark chocolate and did a puree of raspberries minus the seeds –that I halfed and reduced the other part. The reduced added last for intensity! Since this worked so well, I thought how about a reverse? So I made a chocolate version with the 2 raspberry additives. Ooo. Then i thought, how about chunks of white choc?!! …I’ve tried both the cashews and the coconut, both lend some flavoring to the total ice cream pkg. It then becomes personal choice. My problem is finding a tasty recipe to make my own waffle cones ~~would you have one? Hi! May I know what is the size of the freezer-safe container (or loaf pan) that you used in this recipe? Thanks! I feel like I did something wrong, my ice cream was not soft and it was grainy (although still delicious) After blending all the ingredients it was very thick and after I chilled and put into the maker it was hard after not even ten minutes? I blended my cashews in my Ninja blender and followed the recipe step by step, I soaked my cashewsfor 5 1/2 bourse and my coconut milk was chilled before hand, would either of that matter? Will this recipe work in a 1.5 qt. ice cream maker? I noticed the one you linked to in one of the comments is a 2 qt. model. My cashews are soaking, can’t wait to make this! Did it end up working in your 1.5 qt, I have the same size ice cream maker and was just wondering the same thing? Yummiest. Healthy. Ice cream. Ever. I LOVE this recipe!!! Thanks so much for the deliciousness… as we are trying to cut down on sugar I substituted 1/4 cup xylitol and 1/4 cup of dates… perfect. 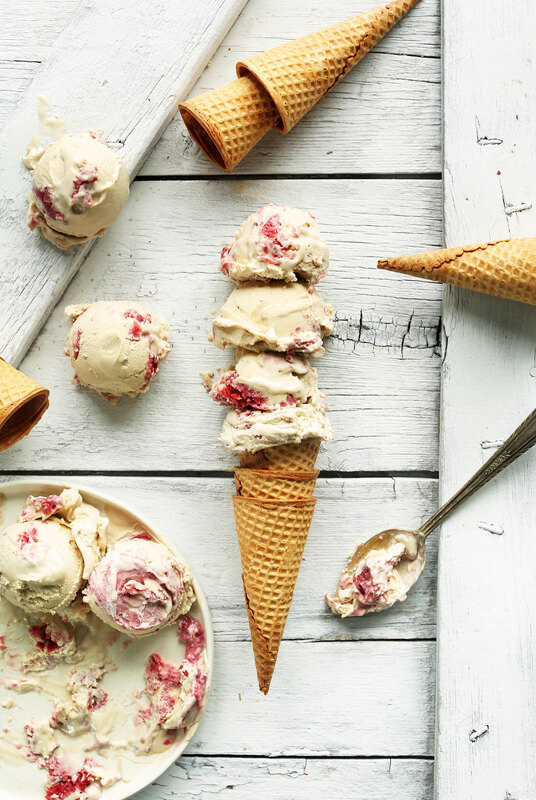 Can’t wait to try more of your recipes, savoury and sweet… and more ice cream… perfect timing for our Australian summer. Thanks for sharing your coconut ice cream with me – it was wonderful! So nice to meet you and John. Can’t wait to get my hands on your new cookbook. I made this ages ago but forgot to leave feedback! It was absolutely delicious. I didn’t have an ice cream maker so I used the method of freezing for several hours, taking it out to mix it up regularly. It ended up a little grainy which must have been due to the lack of ice cream maker. The original runny mixture wasn’t grainy at all (I couldn’t stop dipping my spoon in and slurping it up!). But despite the texture not being perfect it was totally delicious and my kids loved it too. I had no problem with them scarfing down two cones of it in one sitting! Yay! thanks for sharing, Brigid! Hi I was wondering if I could sub the cashews with a different nut? My son is allergic to cashews but would love to make this for the kids! You could ditch the cashews and double up on coconut milk! This sounds great but I’m wondering what you’d suggest for subbing Stevia in for the sweetener? I’m laying off all agave, honey, all sugars for a couple months, but wondering if anyone experimented with stevia. Thanks! I tried this recipe today with ½ cup (packed) pitted fresh dates in place of the sweetener and it turned out well! This turned out very poorly for me! I put it in the freezer for the recommended amount of time (~6 hrs), and it froze solid. I defrosted it and put it in the ice cream maker, but it got hard too quickly and never really got to churn. Meg, in the recipe I say to refrigerate for 5-6 hours. Or, if in a rush, freeze for 1 to 1.5 hours. That’s why it got too firm! Sorry if it was confusing! Oh, no! I can’t read :( Thanks so much for the correction and reply!! I made it tonight. I live for deserts. This icecream was very satisfying for a hot Florida evening. It turned out to look like on your pictures, I even remembered to get the GF sugar cones at the store. Wonderful – thanks for sharing Valentina! I made this last night and it turned out great. The flavor was nice and 3 non-vegans enjoyed it! I totally forgot to add the coconut oil (which I found the next day in the microwave – oops) but it didn’t seem to cause a problem. It churned and got hard very quickly, but that was fine by me. We topped it with some raw cacao nibs and next time I might just add them into the ice cream with the raspberries! Ha! Glad you still enjoyed it! i made this ice cream a few days ago and it was devastatingly good! devastating because it is gone already! :) i have to say, i’ve never made a minimalist baker recipe that wasn’t spot on….and i’ve made quite a few of them. i’m obsessed. ha! So glad you liked it! Thanks for sharing, Abby! Hi! I was wondering what ice cream maker do you use? I had about 1/2-1 teaspoon of cornstarch left and put that in instead of the tablespoon. Do you think it’ll be a problem? Should I buy some and add the rest of the amount to the mix tomorrow morning? I want to give you a big hug for this recipe and this whole blog! My natural path just banned me from sugar, wheat, dairy and gluten-right in time for summer, just great! (note sarcasm) But now I’ve found your blog and delicious recipes and I’m so excited to make them all!! So wonderful! Glad we could be a respite for you in your new dietary journey. xo! Delish!! Only problem was that it didn’t thicken up for some reason. Still tested phenomenal! I tried this out a couple of days ago and it’s so good! Wow! It freezes very solid, so I take it out 15 mins. or so before scooping. Thanks so much! My kids will surely love this! Guess it’s time to start shopping for all the things I need to enjoy this ice cream. Thank you for this Dana! :D Raspberry ripple is my favorite flavor!!! I don’t think so, but it’s worth a shot! I mean, seriously!! You are the bees knees Dana, recipe goddess of all things healthy and delicious! Thank you and keep on creating! So inspired right now! Hi! I am also interested to know if anything other than nuts can be used to make a creamy base. My son is allergic to cashews and tree nuts in general. I made your mint brownie ice cream and it was AMAZING!! But it stressed me out a bit because of the allergy (not life threatening or I wouldn’t have made it, but I obviously want to avoid him getting sick). So I just thought I would ask if you knew of anything else that yielded similar amazing results. Oh my goodness, this looks and sounds amazing!!!! Due to a cashew allergy. can I substitute cashews for a different nut? Just curious.. Does the arrowroot make it stick together more? What is the reason this is added into the mix? I’ve made your Chai ice creamy (yum) and didnt see it there (or maybe i missed it). Wow is all I can say, I used cashew milk instead of coconut and it came out great. I also used four tablespoons of natural cocoa to make chocolate ice cream since it has been a few years since I ate dairy. I blended everything in my high speed blender before doing the faster chill of the freezer. Wonderful! Thanks for sharing, George! $aved on price. Its been a great blender. I’m curious. Do you think the consistency would be different if it had churned for a long time instead of the two to three minutes. It is very good as is, but I wonder how it would have been if it hadn’t frozen so fast. Also, I should have rated it five stars, but haven’t figured out how to edit my rating. If you can fix it please do! I will at least re-rate it on this addition to my reply! I bought a ice cream maker so I could make this! It is so good. One thing that was different than the recipe though is that when I churned it, it became the consistency of soft ice cream within 2 minutes and by 3 it was so thick it wouldn’t churn any more. I will be interested in seeing how the new ice cream maker works with one of their recipes. Interesting! If you chilled it, it really shouldn’t take long to churn, but that’s fast! Mine usually takes 20-30 minutes at least. This ice cream looks like a serious dream! I love raspberries and the colors here are amazing. Holy buckets! I just made this this weekend and it was delicious. Didn’t have an ice cream maker so I had to get a little creative, but it’s still super delicious. I think this may be my new favorite ice cream! Great, thanks for sharing, Katrina! Wow, this ice cream looks simply delicious! I just subscribed to your blog, I love your food photography! The word Ripple makes me salivate. This ice cream is on point, lady! How serendipitous! Hope you give it a try! Let me know how it goes, Natalie! I made this today and it turned incredibly grainy in the ice cream maker 15 minutes into the churning . I followed everything and used light coconut milk. Any suggestions? If it turned out grainy it’s likely because of your blender. Do you have a high speed blender that really pureed it finely? It looks gorgeous. But, I made it, and it just does not taste the way I want ice cream to taste. I don’t think I like the addition of cashews. The texture and taste is off, my instinct says that the pure coconut ice cream is best. I hate leaving a negative comment, sorry. No worries! Thanks for your feedback! Did you by chance make any substitutions? And did you blend it until ultra creamy? So I just finished making this gorgeous recipe but was a bit disappointed in the end…the first bite was initially insanely creamy and delicious but ended with an “off” aftertaste that I can’t place. I didn’t have arrowroot so used the corn starch – wondering if that was it or maybe my cashews were rancid? Any thoughts? Hmm, did you sub any of the sweeteners or oils by chance? Coconut sugar can add a distinct taste, and olive oil can give it a less coconut-forward taste as well. Otherwise, not sure at all! It could’ve been your cashews. Did you soak them for too long? If you soak them past 6-8 hours they can get a little wonky. An you do know that you are entirely responsible for greedy pigs like me going out of control? You should hang your head in shame ( an thank you very much mmmmm, yum, oh yes more). Thanks Jennifer! Hope you experiment with this and love it! I just made this today, and it’s as easy to make as it is delicious! Great recipe! Great! thanks for sharing, Mellie! Whatever black sesame oolong tea with cracked pepper sorbet lady! What can I use instead of coconut milk? Any other milk, almond, rice and hemp being best! Oh my what a wonderful combination! Raspberry and Coconut, I love it! Just curious if you can make this without an ice cream maker? Don’t have one and can’t buy one at this moment but really want to try this recipe. Was just at the farmer’s market yesterday and there was an abundance of raspberries. I can’t believe you made it!! I feel very important now but more to the point, I feel very much like eating a whole tub of that amazing looking ice cream. My mouth is literally watering as I write this. I’m going to HAVE to make it as soon as possible and will report back to you when I do. Ha! So glad it was requested! Please report back when you make it! Ice cream is irresistible in summer, and raspberries, I love raspberries. But I live in Australia and it’s winter here. 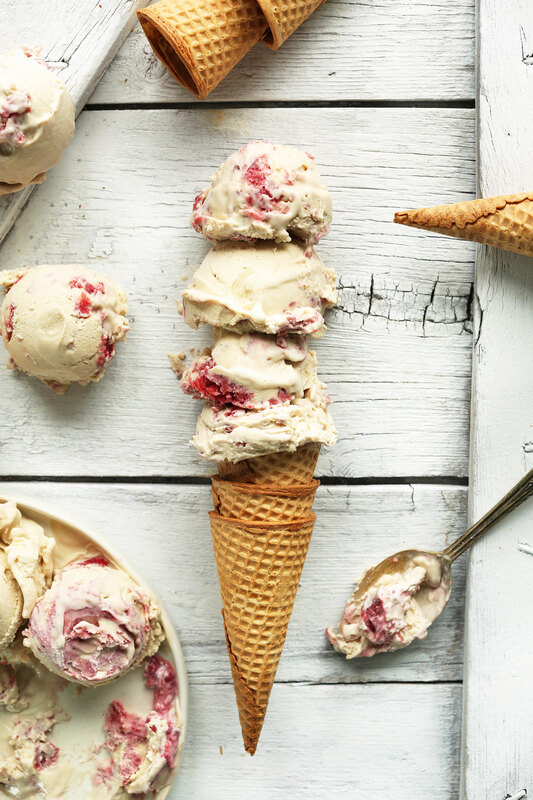 This recipe makes me feel like cranking up the air con so it feels like ice cream weather. ha! Do you what you need to do to make this ice cream! Jealous of your local – Australia is on our list of places to visit! It’s beautiful here. Let me know if you’re ever on the Gold Coast. I can give you some great local tips! What happens if you only use the light version? Will it change flavor and texture? It’s still insanely delicious, just slightly harder to scoop. I just recommend letting it thaw and using a hot scoop! Is there a chance to sub the cashews with almonds? You know, I’m actually getting ready to test a recipe with almonds very soon, so stay tuned! woahhhh this ice cream looks amazing, it looks so creamy it’s hard to believe it’s vegan! This sounds amazing!! I LOVE coconut milk ice cream! Hello, this looks amazing! I’d love to try it. Can you recommend an ice cream maker? 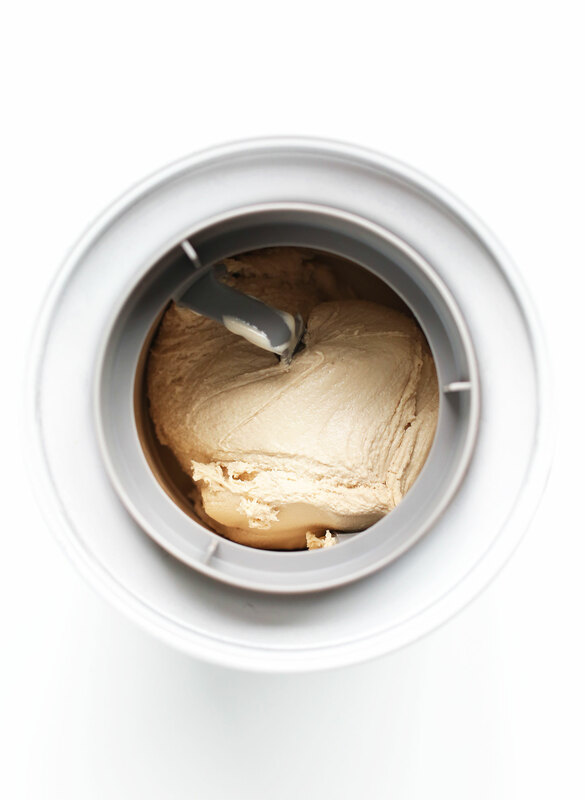 Find all our kitchen essentials (including our ice cream maker) here! Your photography is always so striking! It’s seriously what sets you two apart from all the other food blogs I read. This looks wonderful. I must buy an ice cream maker when I move out from college. So kind!! Thanks Liz. Though it’s not essential, we’ve found our ice cream make to be an appliance we actually put to frequent use! What kind of ice cream maker do you have/recommend? Looking to invest in one for the summer! Homemade ice cream makes me so dang happy. And that raspberry ripple? Perfection! This sounds so good! I love this flavour! It’s definitely worth it in my opinion, especially since vegan ice creams are already so expensive to buy at the store! They are pretty essential to the recipe, Giada! Same question! My daughter is allergic :( I’m gonna play with coconut kefir and silken tofu ?